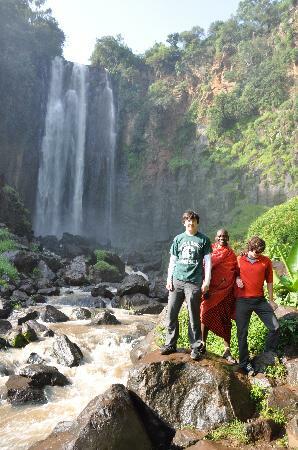 Thomson's Falls is a 74 metres scenic waterfall on the Ewaso Ng'iro river, which drains from the Aberdare Mountain Range. It is situated 3 kilometres from the town of Nyahururu in central Kenya, at 2,360 metres elevation. 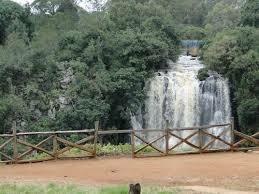 The famous Thomson's falls is located in Nyahururu, Laikipia. Nyahururu town lies at high altitude 2,360 meters (7,750 feet ) with a splendind climate and is Kenya highest town sorrounded by pretty tracts of forests and agricultural lands and the region benefitss from high rainfall. The scenic of famous Thomson falls is 243 feet high ( 74 Meters) on the Ewaso Nyiro river which drains from the Aberdare mountain ranges. It is situated two miles from the townof Nyahururu in Central Kenya. Just next to Thamson falls is the Thomson's Fall Lodge which was built by Joseph Thomson, after he discovered the Thomson's Falls. He was the first to reach the falls in 1883 and named them after his father. He was a Scottish geologist and naturalist and also the first European to walk from Mombasa to Lake Victoria in the early 1880s. The area was originally a part of the indigenous forest surrounding the famous falls which to date is a home to many animals like the columbus monkeys, elephants in the marmanet south forest, hippo pool and various species. Visitors can see the falls from above, but there is also a path towards the bottom of a ravine. Visitors get to have a perfect view of the water falls from above or alternatively can follow the trail down to the bottom of the ravine for a closer look. The water from the falls makes for the best hippopotamus swimming pools in Kenya. Upstream from the falls is one of the highest hippo pools in Kenya. - Entry fee to the Thamson Falls, Hippo pool and marmanet south forest for elephant viewing and birding, botanical walks and panoramic view of Ewaso Nyiro valley.